At the heart of peacemaking in 1919 was not any individual, or group of men, or even mode of organisation; it was the term ‘principle of nationality’ that lent legitimacy and lifeblood to a process often mired in ideological confusion and bedevilled intentions. So far I have argued that contemporary interest in the ‘psychological reality’ of the nation, as the turn-of-the-century French journal La femme nouvelle had put it, was implicit in the conception of nations as political entities or states. The history of science, and psychology more specifically, was critical to the political and cultural purchase of the principle of nationality, and its hearkening to a democratic new world order. 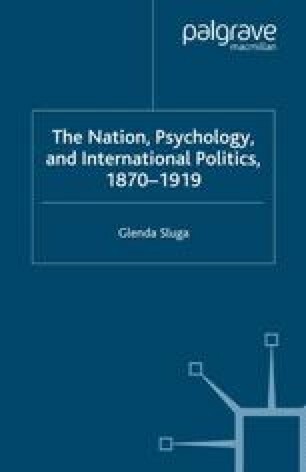 The theories of the self that Walter Pillsbury described in 1919 as among the three main approaches to the study of the nation are of particular interest in this context, given that they bestowed political nations with psychological characteristics normally associated with an individual’s capacity for political agency, also termed self-determination. In spite of the view stated in La femme nouvelle, that national patriotism was a disposition that ‘everyone’ could find in oneself, it was precisely the application of theories of the self to the idea of the nation that privileged masculinity and rendered women’s place in the political nation problematic.